Hubsan has produced many different types of drones throughout the years, all of which have been pretty successful in the drone market. Released back in 2015, they've come up with the Hubsan H501S X4 quadcopter drone which is full of useful features, giving you a high-quality performance with a rather affordable price tag. 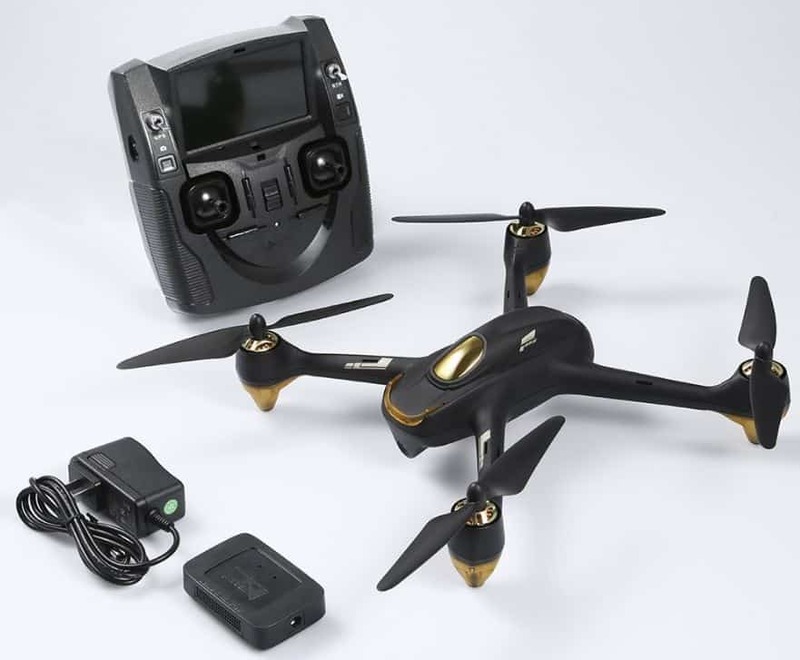 The H501S X4 FPV quadcopter is designed for excellent quality video footage and photos, and as many drone enthusiasts are noting, it's one of the more affordable quadcopter drones for taking "selfie" photos. 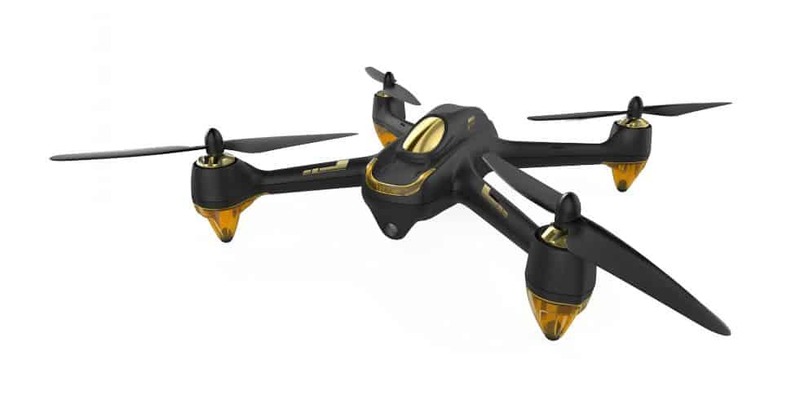 This Hubsan drone version is considered to be a cheaper version of the H501S High Edition, but the only obvious difference between the two is their control distance in which the High Edition has a longer range. The next step up in the Hubsan line of drones would be the Hubsan H109S X4. Who is the Hubsan H501S X4 For? Although the H501S X4 is equipped with an almost intimidating amount of features, it's considered to be an ideal starter drone. 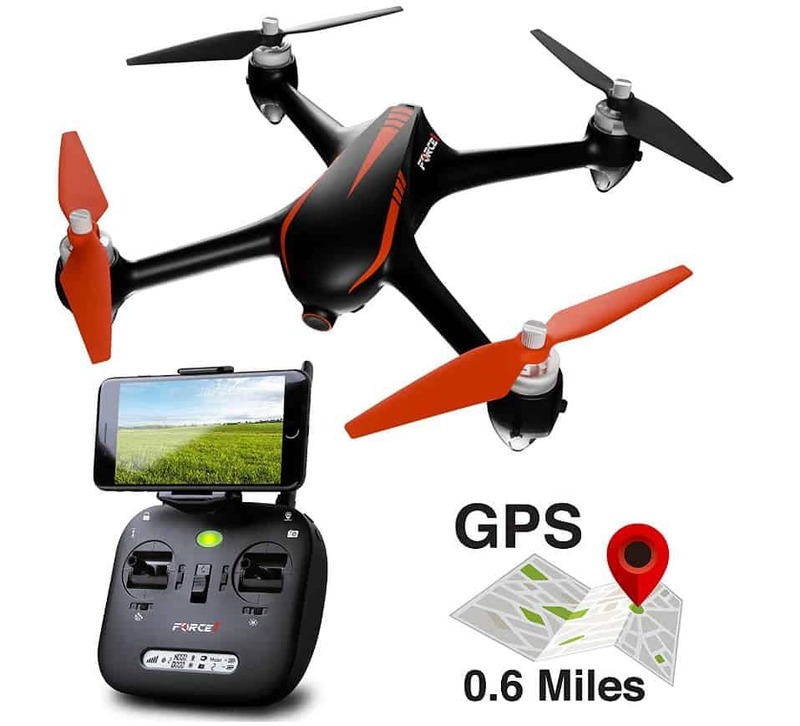 The controls on this GPS drone are rather simple, so it can be used by those who are just getting into using drones for their travel vlogs, landscape pictures, or just for social media. Being that it has a relatively affordable price point, it's practical for mainly casual use. The 1080p camera resolution is good for when you're visiting a different country and wish to share the beautiful scenery with your friends online. Although, if you're capturing footage for a professional project, it may be best to invest in a more expensive drone that has even more features and a higher resolution camera. The H501S X4 is small and powerful, but if you like to shoot video in the highest resolution possible and have a long control range for better sweeps and higher altitudes, you may be looking for something a little higher in price range. It doesn't come with a microSD card, so you're going to have to purchase one separately in order for the 1080p camera to save your photos and footage. The remote control transmitter needs four AA batteries to operate, but these are not included. There aren't any extra replacement parts for the drone, but they are available to purchase whether you need blades or another battery. You don't have to worry about having a screwdriver handy when attaching the propellers since you can screw them on by hand. Also, it's recommended you get a better balance charger for your batteries so they'll last longer since the included one doesn't do that well of a job. Some users may wish to use the drone with FPV goggles, but since the H501S X4 doesn't include goggles in any known set, you can find some here. Additionally, drones can get rather loud after prolonged use because of the motors wearing down, so it's important that you get synthetic oil to properly lubricate your drone for a safer and quieter operation. The many features of the Hubsan H501S X4 are what makes it such a popular starter drone. In both the quadcopter and the remote transmitter is a GPS system that actively enables a Follow Me mode. This mode makes the drone lock onto the location of the transmitter (which is most likely being held by you) and will track and follow it. This can be a pretty handy feature for when you're recording a moving object that would traditionally be difficult to follow manually. The Follow Me function mode is also very useful for selfies since the drone is able to track and independently follow it without the pilot having to do anything. It's as simple as focusing the camera on your face, striking a pose, and pressing the capture button. The Barometer Altitude mode makes the drone hover in place at a specific height and maintains the same height autonomously without you having to press or hold a button. It keeps the height based on the readings from a barometer while horizontal movement and rotation (or yaw) will still be active. This is a great feature for if you're if you're shooting a sweeping landscape video and wish to maintain the same height to get a consistent and smooth shot. It's also good for biking videos so you can have the drone follow and film you at a sufficient head-level height. The Headless mode lets the H501S X4 fly towards whatever direction is relative to the pilot's controls. With this, there is no defined "head" or "tail" of the drone which eliminates any confusing control directions and inverted flight patterns. Pressing forward means the drone will move forward, pressing right moves it right, etc. This makes the drone much easier to operate especially for beginners. The OSD Live Data is another nifty feature that is directly displayed on the First Person View LCD monitor that's built into the remote control transmitter. The live data shows the pilot information such as the drone's position, its speed, altitude, how much battery life it has left, and many other stats. 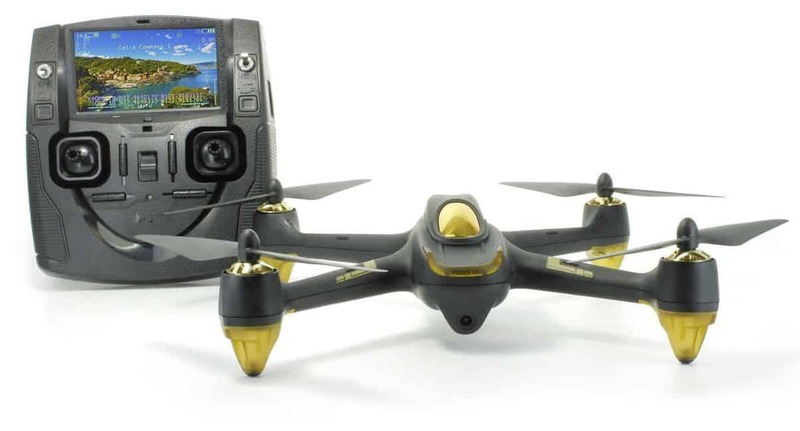 On the transmitter itself, the screen is 4.3 inches in size and allows you to see real-time video from the drone's camera at a 640 x 480 resolution. A 5.8 GHz link is used to connect to the video signal while the controls work on 2.4 GHz to prevent any cross interference from other similar remotes. The controller is also a bit heavy and large, but otherwise easy to operate. Although the video quality is high at 1080p, the LCD screen is not very clear at night and the camera doesn't really live up to the expectations of anyone thinking they'll be able to shoot crystal clear videos and photos. The camera is integrated with the drone so it can't be removed. It's also key to know that photos and videos are recorded and saved onto a Micro-SD card so you'll need an SD card adapter if you're planning to transfer your data onto a computer editing software. The H501S X4 has a maximum capacity of 16 GB of data. One of the most important and very useful features of the H501S X4 is the One-Key Return Landing or return to home. Because of its GPS-backed navigation system, the drone is able to recall where its takeoff point was. If the connection is ever dropped or lost with the transmitter, the drone's Failsafe Mode will activate and the drone will automatically return home and land safely. The Failsafe Mode can also be triggered manually by using a switch on the remote transmitter. This mode is great for if you lose sight of your drone or get confused as to where your drone is for you can just prompt it back home anytime. The brushless motors give the drone a better performance compared to brushed motors. While both types are very similar, brushless motors have a longer lifespan since they don't have brushes that can wear out. There's also more power being used for rotational force and less being lost as heat. The H501S X4 has one of the longest flight times for drones of its kind and price range. You can fly it for up to 20 minutes because of its large yet powerful 7.4V 2700mAh LiPo battery which weighs about 105g and takes 2.5 hours to charge. For reference, the average flight time of most drones of this price point is around 15 minutes. As for flight range, the H501S X4 has a decently long range of 300 meters which is pretty good for such an affordable drone. There aren't too many differences between the standard and professional version, although these slight differences may matter depending on what you're filming and using the drone for. The H501S X4 High Edition has a flight range of 997 meters instead of 300. The transmitter display on the High Edition is smaller at 3 x 2 inches and still has a 640 x 480 resolution. Its maximum transmission distance (that's FCC compliant) for the remote controller is 450m compared the standard edition's 300m. Also, while the standard version's controller requires four AA batteries, the controller for the High Edition requires eight. As for the rest of its features, they're the same as those on the standard drone. As you take the drone out of the box, it's rather easy to set up. The propellers don't come already screwed on so you need to screw all four of them onto the drone's motors first. This can easily be done by hand, you don't need a special tool. If you wish to loosen the motors, there's a handy tool that comes with the drone to help you do so. After the propellers are screwed, make sure the battery in the drone is fully charged. Usually, Hubsan drones are partially charged from the factory, but it's best to run your test flights on a 100% charged battery. For the remote, all you need to do is pop in four AA batteries for it to work, take off all the protective nubs from the toggle sticks, peel off the screen guard, and screw in the antennae. When you're all set, you can lastly insert your Micro-SD card. Calibrating the drone requires you to pick it up and spin it vertically until the calibration compass message disappears from the screen on the transmitter. When you're first testing out the drone for flight, it's best to have the "home" toggle switch in the "on" position in case you lose control or your drone flies out of range. It's recommended not to fly the drone in any strong winds for this will affect its stability and in turn, it will also affect the quality of your videos and photos. Flying the Hubsan H501S drone in an open area with little to no obstruction such as trees or buildings will give you less trouble as you attempt takeoff, flight, and landing. When in Follow Me mode, the drone does a good job of tracking and following the GPS in the transmitter, but keep in mind that the camera end of the drone doesn't seem to have a full range of motion so it won't keep you in the center of the video or image. Maintaining your drone is simple for all you need to do is keep the overall body clean and make sure no water or dirt enters into the motors. Lubricate your motors when you feel the drone is getting louder with each use and you can also optionally put on propeller protectors to keep them from snapping when not in use or when you're traveling with the drone. Check out the video below for more details on the Hubsan X4 501S! 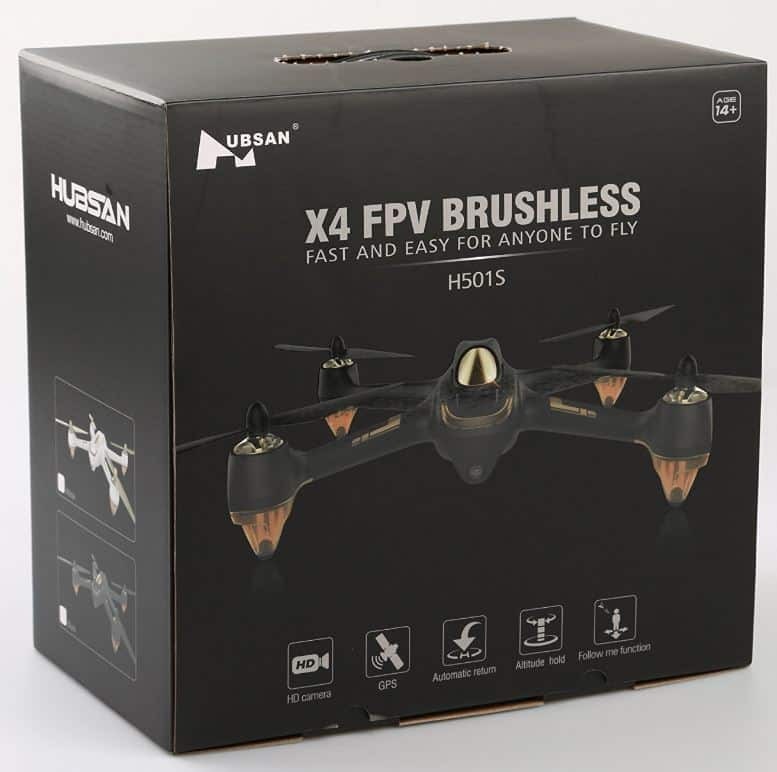 An equal alternative to the Hubsan H501S X4 is the Force1 F200W Shadow drone. It's equipped with a 1080p HD drone camera that supports live video so you can see in FPV what your drone sees. It has three return-home modes that enable it to come back to its launch point from up to 500 meters. You can use this drone whether you're a beginner or a pro with its simple 1-key lift/land command, altitude hold, and headless mode. Its remote control doesn't come with an integrated video screen, but it does have a smartphone holder. You can keep track of stats through the remote's LCD screen at the bottom and the remote itself provides a strong two 2.4Ghz connection. With its brushless motors and electronic speed control, the F200W Shadow drone can be another sound option to the Hubsan H501S X4 for around the same price range. The Bugs 2 is another great alternative around the same price range. Check out our full review of the Bugs 2 Drone. 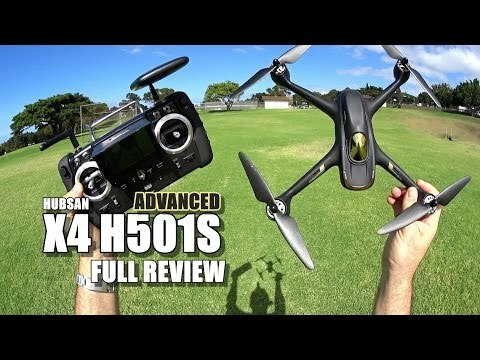 Ultimately, our Hubsan H501S X4 review reveals that it is the ideal beginner's drone for casually capturing footage and taking pictures. It may not have as many advanced features as other more expensive drones, but it definitely does the job for those who are just starting out or aren't very tech savvy. Its many controls and features are rather simple to use and the video quality stands at 1080p resolution. Although, if you're looking to shoot more professional quality videos and photos, it's best to invest a little more cash into a more advanced drone model.